As a parable of evolution, devolution and revolution, of nuclear holocaust, viral plagues and time streams so twisty that characters become their own ancestors, there is nothing in cinema quite like the Planet of the Apes series. 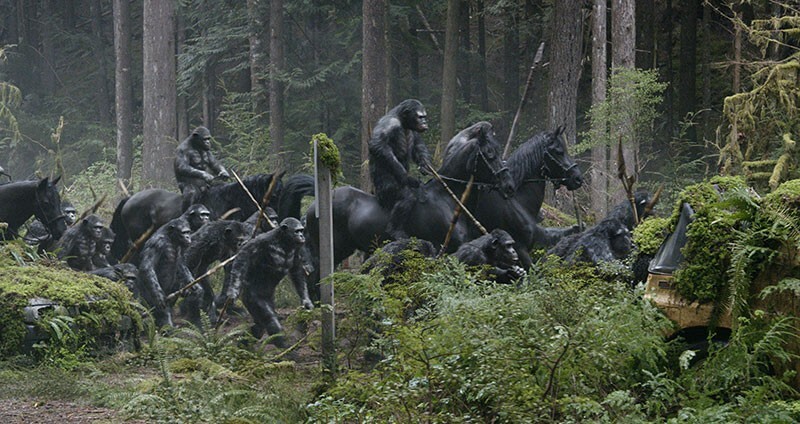 The phenomenon continues July 11 with the release of Dawn of the Planet of the Apes. 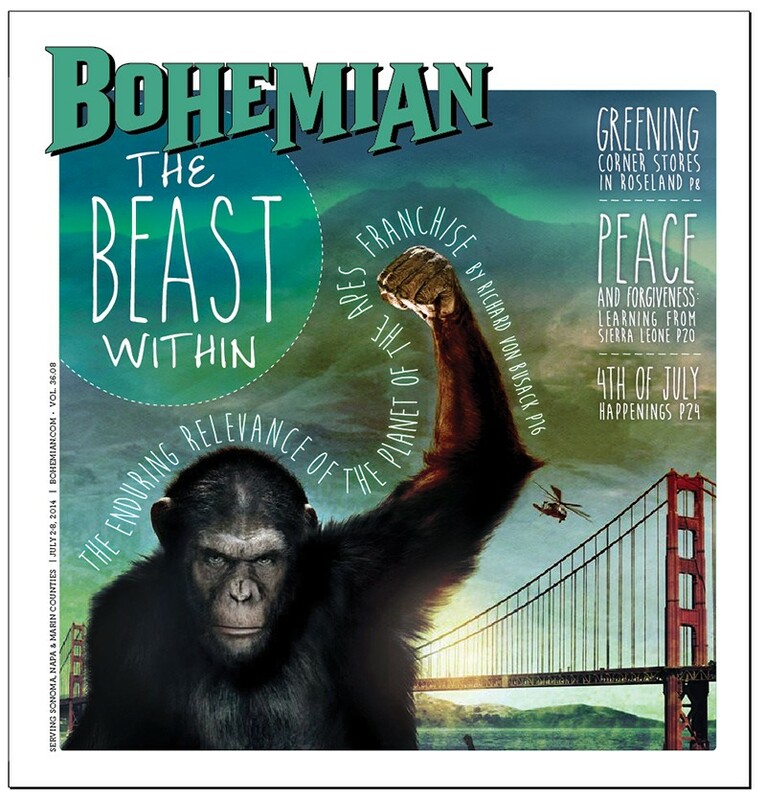 The series is safe as an entertainment for older children—2011's Rise of the Planet of the Apes had deft, kid-pleasing sequences of Caesar the chimp in his Curious George phase, brachiating around a Victorian house in San Mateo. And yet the series is apocalyptic in its implications, drastic in its premises. A barrel-of-monkeys amusement, it foretells the human race's end in a tale of Ambrose Bierce–worthy bitterness that makes sure we deserve that end every time. Dawn picks up 15 years after Rise. The super-intelligent chimp Caesar (emoted by the peerless synthespian Andy Serkis) has parted ways with his scientist foster-father James Franco. Caesar is now the leader of a tribe of mixed hominids: escapees from a cruel gene-tech lab in South San Francisco, the evil San Bruno Primate Shelter and an unnamed Bay Area zoo. After a terrific man/monkey battle on the Golden Gate Bridge, the apes relocated to the tallest timber in sight, Muir Woods and Mt. Tamalpais. In our near future, San Francisco is a mossy ruin, and few humans remain after a global outburst of ape-transmitted hemorrhagic fever has cleared the planet. The question facing the survivors was posed some time ago, on the poster of Beneath the Planet of the Apes (1970). The tagline paraphrased the "House Divided" speech of Abraham Lincoln—portrayed as an Ape-raham Lincoln in the finale of Tim Burton's underwhelming 2001 remake of Planet of the Apes. As Old Abe almost said: "Can a planet long endure half human and half ape?" In Planet of the Apes (1968), American astronauts land on a planet where the great apes have evolved and humans are post-verbal. Ape-human coexistence was given the same earnest poring over that racial politics got in that dead era: Were we moving too fast? Would you want your sister to marry a human? The problem of humans is mulled over by liberal chimps, clerical orangutans and martial gorillas. During the shooting of the original 1968 film, director Franklin Schaffner encouraged the code phrase "NP"—"no polemics"—whenever it looked like the politics was showing too much. The warning failed: this multi-film series played the race card with Ricky Jay–worthy dexterity. Eyeing the sequels of The Planet of the Apes, the film's star Charlton Heston worried in his diary: "Very political, very '60s political." The original, made in a year of political strife as bad as our own, is a stunner. Count the ways: Jerry Goldsmith composed the soundtrack with barbaric brass and eerie, tinkling cymbals. Former blacklistee Michael Wilson and conscience-of-America Rod Serling wrote the script, and the deft stunt work and the southwestern locations framed some heavyweight actors. Shakespeareans and other legitimate theater types played the ape gentry, including Maurice Evans, the most piss-florid Macbeth ever seen on screen, as the skeptical Dr. Zaius. Representing mankind: Heston. In this movie of vast space-time travel, bigotry and war-fever, Planet of the Apes was a sci-fi fire sermon, complete with a jeremiad from the Ape Bible, Scroll 29, verse 6: "Beware the beast, Man, for he is the Devil's spawn. Alone among God's primates, he kills for sport, or lust, or greed. Yea, he will murder his brother to possess his brother's land. Let him not breed in great numbers, for he will make a desert of his home and yours. Shun him; drive him back into his jungle lair, for he is the harbinger of death." After Planet came the brilliantly strange Beneath the Planet of the Apes (1970) and the pivotal Escape from the Planet of the Apes (1971). This was followed by one of the most radical studio films ever made, Conquest of the Planet of the Apes (1972), and ultimately the hasty-pudding finale, Battle for the Planet of the Apes (1973).